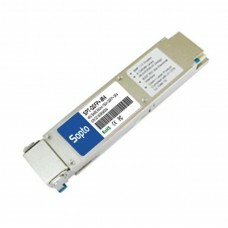 This product is a transceiver module designed for 2m-2km optical communication applications. The design is reference to 40GBASE-IR4 of the IEEE P802.3ba standard. The module converts 4 inputs channels (ch) of 10Gb/s electrical data to 4 CWDM optical signals, and multiplexes them into a single channel for 40Gb/s optical transmission. Reversely, on the receiver side, the module optically de-multiplexes a 40Gb/s input into 4 CWDM channels signals, and converts them to 4 channel output electrical data. The central wavelengths of the 4 CWDM channels are 1271, 1291, 1311 and 1331 nm as members of the CWDM wavelength grid defined in ITU-T G694.2. It contains a duplex LC connector for the optical interface and a 148-pin connector for the electrical interface. To minimize the optical dispersion in the long-haul system, single-mode fiber (SMF) has to be applied in this module. This product converts the 4-channel 10Gb/s electrical input data into CWDM optical signals (light), by a driven 4-wavelength Distributed Feedback Laser (DFB) array. The light is combined by the MUX parts as a 40Gb/s data, propagating out of the transmitter module from the SMF. The receiver module accepts the 40Gb/s CWDM optical signals input, and de-multiplexes it into 4 individual 10Gb/s channels with different wavelength. Each wavelength light is collected by a discrete photo diode, and then outputted as electric data after amplified by a TIA. Figure 1 shows the functional block diagram of this product. Module Present (ModPrsL) is a signal local to the host board which, in the absence of a product, is normally pulled up to the host Vcc. When the product is inserted into the connector, it completes the path to ground though a resistor on the host board and asserts the signal. ModPrsL then indicates its present by setting ModPrsL to a “Low” state. The following electrical characteristics are defined over the Recommended Operating temperature and supply voltage unless otherwise specified. This transceiver is specified as ESD threshold 1kV for all electrical input pins, tested per MIL-STD-883, Method 3015.4 /JESD22-A114-A (HBM). However, normal ESD precautions are still required during the handling of this module. This transceiver is shipped in ESD protective packaging. It should be removed from the packaging and handled only in an ESD protected environment.